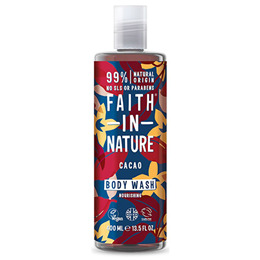 This luxurious blend of extracts from organic cocoa beans and vanilla is infused with sage to nourish your senses. Packed with wonderful aromas to soothe your day. Aqua (Water), Ammonium laureth sulfate*, Maris sal (Sea salt), Polysorbate 20*, Cocamidopropyl betaine*, Theobroma cacao (cocoa) extract**, Vanilla planifolia fruit extract*, Ascophyllum nodosum powder***, Melaleuca alternifolia leaf oil, Potassium sorbate, Sodium benzoate, Citric acid*. 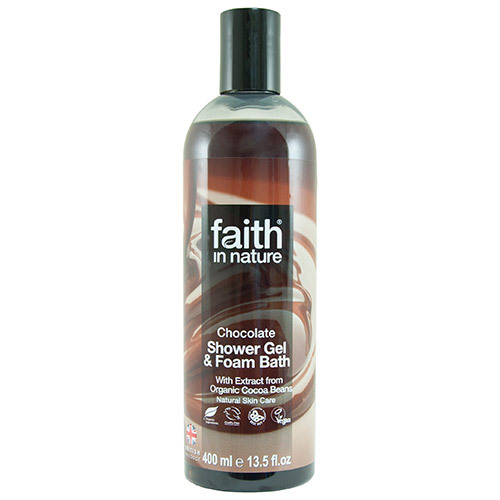 Below are reviews of Faith in Nature Chocolate Shower Gel & Foam Bath - 400ml by bodykind customers. If you have tried this product we'd love to hear what you think so please leave a review. This smells like the richest, most delicious chocolate cake!